Matt Groenheide is a percussion performer and educator from Lethbridge, Alberta, Canada. Matt loves the variety that comes from being a percussionist and is well-versed in drumset, world drumming, and classical percussion. Together with his wife – Jodi Groenheide (flute & percussion) – Matt performs in the jamani duo, a fun and energetic group that blends classical, world, and popular music together on a collection of diverse instruments from around the world. Matt is the new Director of Worship and Creative Arts at Lethbridge’s First Baptist Church. at the U of L Conservatory of Music, and as a private instructor. He teaches clinics and workshops for school bands, community organizations, and other groups. Matt’s favorite time of the year is his summers at MusiCamp Alberta – the premier summer music experience in the province. As a world percussionist, Matt plays and teaches Caribbean steel pans, African percussion and kalimba, Afro-Cuban drumming, Japanese Taiko, Brazilian Samba, Polynesian log drumming, Peruvian cajon, and more. He performs frequently with the U of L Global Drums Percussion Ensemble. Matt plays with the Lethbridge Symphony Orchestra (LSO) and was the winner of the 2011 LSO Young Artist Competition. He has appeared as a concerto soloist with the LSO, the University of Lethbridge (U of L) Wind Orchestra, and the Musaeus string quartet. 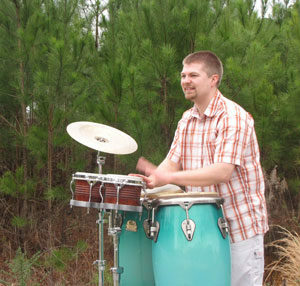 As a drumset player, Matt has played with the Afro-Celtic reggae group Dr. Zoo in addition to other folk bands and church worship groups. His worldwide performances have included Trinidad and Tobago, the Netherlands, London, Japan, Hawai’i, and many parts of Canada and the U.S.
As an officer of the Alberta Chapter of the Percussive Arts Society (PAS), Matt has been involved with organizing many successful Day of Percussion events and receiving the 2016 PAS Outstanding Chapter Award. Matt holds a Master of Music from the University of Southern Mississippi – where he studied with internationally renowned snare drummer/steel pannist Dr. John Wooton (AKA “Dr. Throwdown”) – and a Bachelor of Music from the University of Lethbridge – where he studied with master educator Adam Mason. Instructor for various Play On ensembles, as well as Solo drumset and steel pan.